(PRINCETON, NJ) — Morven Museum & Garden hosts Masters of Illusion: The Legacy of John F. Peto from November 15th 2018 through May 12, 2019. Morven has partnered with the John F. Peto Studio Museum, to present a new look at trompe l’oeil art in New Jersey. Trompe l’oeil, pronounced “tromp loi,” is a French phrase meaning “to deceive the eye,” which is used to describe paintings that create the illusion of a three dimensional scene. There will be an Opening Reception on November 14 at 6:00pm. 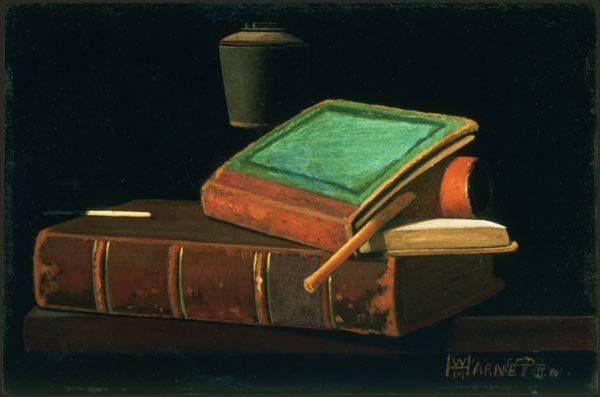 Born in Philadelphia in 1854, John Frederick Peto is now recognized as one of America’s most accomplished trompe l’oeil artists. After studying at the Pennsylvania Academy of Fine Arts, Peto moved to Island Heights, New Jersey where he played cornet in the Methodist Camp and worked quietly out of the public eye. In addition to Peto’s paintings, the exhibition will feature Peto’s photography done in and around Island Heights. The John F. Peto Studio Museum is housed in the 19th century home and studio he built. In addition to preserving Peto’s history, the museum has become the place to view the work of contemporary trompe l’oeil artists. One of Morven’s galleries will present his legacy through contemporary artists who have participated in the Peto Museum’s Tri-State Invitational Exhibition. Two final galleries will represent the work of New Jersey’s most well-known contemporary trompe l’oeil artist, Gary Erbe. Morven is delighted to exhibit a portion of Gary Erbe: 50 Year Retrospective, which has traveled to The Butler Institute of American Art (OH), Brinton Museum (WY), the Reading Public Museum(PA), and the John F. Peto Studio Museum (NJ). Morven Museum & Garden is located at 55 Stockton Street in Princeton, New Jersey.